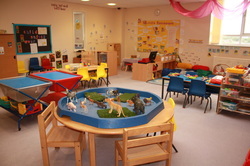 Teeny Tots Nursery is owned and run by the BSS Highgate Charity and is located in the Saffron Centre on the First Floor. There are four large rooms to the nursery each bathed in natural light. The nursery has a large outside play area which has safety floor covering and a wooden sun shade. We aim to provide children in our care with a fun, caring and enjoyable environment where they will be given first hand real experiences and resources that are stimulating for them to experiment, explore, and learn to be independent. We value that learning takes place through enhanced play opportunities and that children’s play reflects their wide range of varied interests. We recognise the importance of listening to children, understanding, and meeting their individual needs. All team members are qualified with relevant Childcare Qualifications (Level 3 and above).